At Haileybury Almaty we believe that one of the most important aspects of education is the development of HaileyburyHabits such as resilience, courage and organisation. But our teachers don’t just talk about these habits – they put them into action! 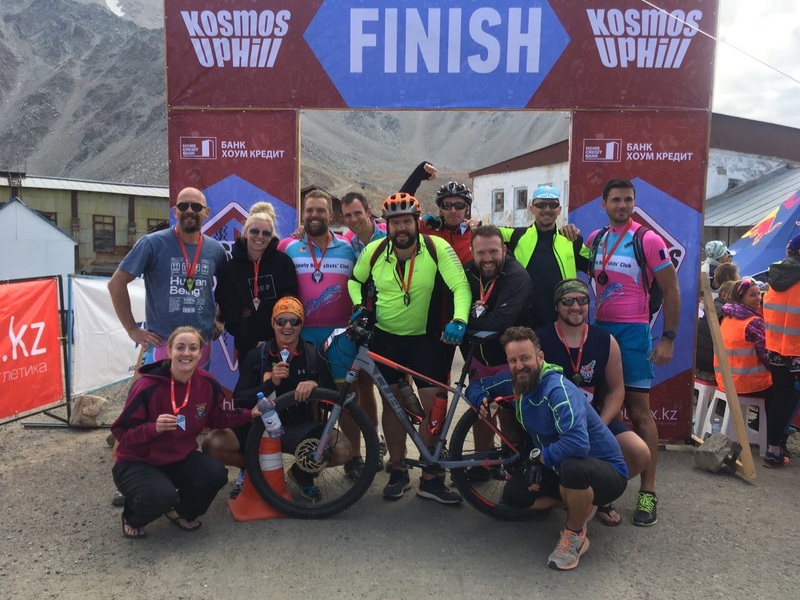 This year, for the second time, a teachers’ team participated in the KosmosUpHill race for extreme athletes. This daunting challenge requires participants to run or cycle up the steep mountain roads and tracks, all the way from the ‘Three Bears’ near Almarasan to the Big Almaty Lake (BAO), and then on past the Tian-Shan Observatory to the Cosmological Station (Kosmostantsiya), at an altitude of over 3300 metres. This year’s Haileybury Almaty team consisted of Matt Aston, Julien Barrett, Emily Belshaw, Thomas Browning-Stamp, Jonathan Crew, Calum Erskine, Neil French, Peter Gooding, Stephanie Jones, Josh Curtis, Graeme Morley, Will Neylon, and Tom Wilde. The fastest finisher from Haileybury Almaty was Matt Aston, who ran the gruelling course in just 1 hour 59 minutes, smashing the previous school record set by Paul Wilkinson in 2016 (2h 12m). This placed Mr Aston fifth out of 62 runners in his age category. We congratulate our teachers and wish them further success in promoting a healthy lifestyle and sport! A-level student Aruzhan Koshkarova and her team took part in the Republican conference “Digital Kazakhstan,” attended by the President of the Republic of Kazakhstan, Nursultan Nazarbayev. Aruzhan and her team present their successful online start-up “Qamcare” to the conference. The team of Almaty pupils won the Grand Prize Award in the International IT Competition “Technovation Challenge”, held in August in San Francisco. The girls presented their “QamCare” mobile app, which tracks the user’s movements and immediately notifies relatives and trusted friends of their location in case of emergency. This will help reduce the number of people who go missing every year in Kazakhstan – especially young women. Aruzhan joined Haileybury Almaty after successfully taking part in our English Olympiad and passing our selection criteria for scholarship. Aruzhan is now an A-level scholar, studying mathematics, physics, economics and computer science. We are proud to have such a bright star at our school! We believe that after completing her international education at Haileybury Almaty, Aruzhan will be fully prepared to develop new projects to help solve other social problems. In Britain we have a strong tradition of producing world-class top mathematicians through the British educational system. The Field Medal was founded in 1936 and is often regarded as the equivalent of a Nobel Prize for Mathematics (the Nobel Prize categories do not include mathematics). The Field Medal is a prize awarded to two, three, or four mathematicians under 40 years of age at the International Congress of the International Mathematical Union, which takes place every four years. The USA, France and Britain have dominated the awards of the Medal. Of the 54 medals awarded so far, 25 have gone to the USA, twelve to France and eight to Britain. Japan and the former Soviet Union have had two each. This continues if we consider the PISA tests for 15 years olds across the world. The most recent results demonstrate the strengths of mathematics teaching in British independent schools such as Haileybury. In the world rankings, UK independent schools are ranked joint second with Hong Kong, just behind Singapore. As a British international schools in Kazakhstan, our Mathematics Faculty incorporates the best traditions of UK independent schools’ teaching of a British mathematics curriculum alongside the best traditions of mathematics in Kazakhstan. We are proud of what we have achieved over the last few years in Mathematics. We hope to achieve even more success in the coming years, and constantly look at new ways of pushing our pupils in Mathematics. “Life in the Sixth Form at Haileybury Almaty is an incredibly rich and diverse experience” according to a former pupil. On arrival in the sixth form even more leadership and service opportunities are available to pupils and they begin in earnest the university application process. Haileybury Almaty offers the highest quality education in the 16-19 age range through the British styled A levels. Our students are guided to realise their full potential and access the best universities around the world. With the support of our shareholders and Governors we are able to guarantee small class sizes and a staff of experienced A level teachers and highly qualified and experienced support through the application process anywhere in the world including the US and the UK. Students are encouraged to take more responsibility for their own learning and to grow and mature as an individual. This year we are expanding our career guidance and university counseling services in several significant ways as we prepare our strongest Sixth Form yet at Haileybury Almaty. We are delighted to welcome David Levi as our Director of U.S. Admissions – David brings a wealth of experience helping international students get accepted into American universities as well as the personal experience of having graduated from Harvard University with a Master’s Degree. Along with Head of Sixth Form Mary Eckersall, David is leading additional SAT preparation sessions and giving students additional personalized guidance as they make their application decisions. University admissions programmes instituted by Mary Eckersall, including guided preparation for IELTS/TOEFL, systematic investigations of financial aid opportunities, university fairs, and the registration of our school as an SAT testing center, are continuing to put Haileybury Almaty on the map as Central Asia’s top international school. With David Levi, we plan to host large-scale education forums in years ahead, deepen ties with top universities, raise the profile and positive impact of our scholarship programme, and propel our students further to ever-greater achievements. This month we welcomed Kirsty Anderson, Senior Consultant of Public and Community Engagement at Global CCS Institute to Haileybury Astana. She enthralled our Year 5 and 6 pupils with her exciting ‘Engergising Energy’ workshop using everything from ‘blankets of carbon dioxide’ to popping candy and chocolate bars to help put complex concepts of climate change and low carbon energy technologies in a familiar and relevant context. Her workshop left us all with much food for thought on ways to save energy and a challenge to find new ways to share information about Carbon Capture technologies with others – let’s see what our imaginative and resourceful Haileybury pupils come up with! Kirsty thoroughly enjoyed her visit to both Astana and Haileybury. She has led workshops in schools all over the world and was very impressed by our pupil’s level of knowledge and engagement during her time with them.